Need more information about booking Home 101849 ? Chalet Beaumont is a comfortable modern detached alpine chalet set on a gentle slope among other similar chalets in the village of Vallandry, at the heart of the Paradiski area. Spectacular views from the balcony and panoramic lounge windows stretch down the Isere valley. The chalet is easily accessible by car and on foot (no steps). The chalet is under 5 minutes on foot from the main Vallandry lift, ski school and all the shops (no steps). There is easy car access right to the front of the chalet for loading and unloading and free parking just above the chalet. There is free wifi internet broadband. Sunday-Sunday turnover for the 2019/20 Ski Season due to constant problems on the roads on Saturdays, queues in ski rental shops and the ability to profit from the empty slopes on a Saturday. Chalet Beaumont is welcoming and spacious, living on the top floor and sleeping downstairs (3 bedrooms). There is a large log burner in the lounge area. The kitchen is particularly well equipped so that you can cook at home (supermarket 5 minutes on foot). The twin beds in all 3 rooms can be pushed together to make doubles if desired (good to bring your own fitted kingsize sheet to hold it all together!). The bathroom has a bath with shower over, a basin and a large hot-water tank so everyone can warm up and relax at the end of the day. The master bedroom has an ensuite shower room. There is a further wash-room upstairs. The Chalet has electric underfloor heating, heaters with glove drying racks, heated boot-rack, space for skis and a very useful washing machine. There is English and French TV and external sockets for consoles, ipods and computers. Winter turnover day is Saturday. Discounts for last-minute bookings are always available. You do not need transport in the village as everything is walkable. The Chalet is 5 minutes on foot from all shops, bars, restaurants, ski school and the main Vallandry ski lift. There is a free navette bus system which operates between all the nearby resorts. If you want to profit from the empty ski slopes on the Saturdays then a good tip is to book a hotel around Moutiers, which is about 40 minutes from Vallandry. Our chalet is managed by PVR who have a reception in the village and this is your first point of call for the keys, booking extra services and for any concerns. They are very very efficient. Dogs are allowed but they must not be left alone all day in the chalet. Linen and Final Cleaning are included in the WINTER price. In SUMMER the linen (€12.50 per person or €21.50 per person if towels and robes to be included) and cleaning (€180) are paid directly to our management company when collecting your key. 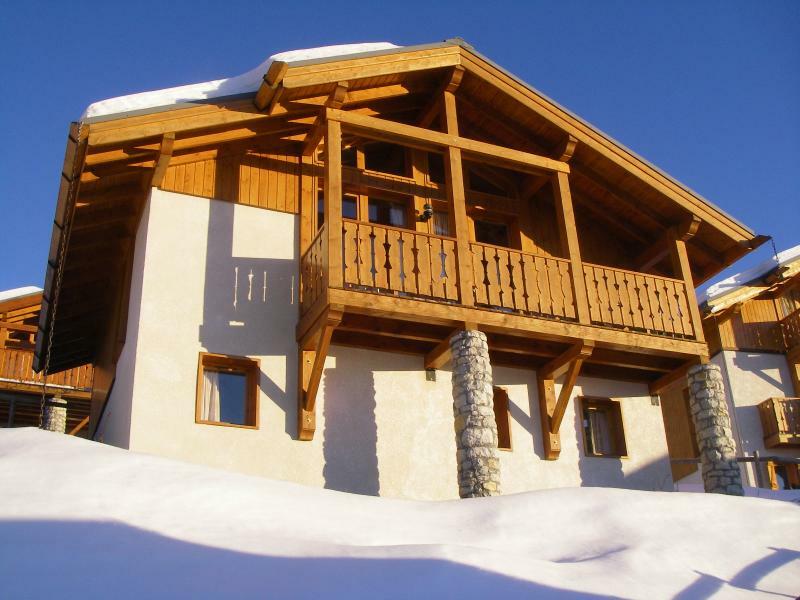 This Chalet has 3 bedrooms, 4 bathrooms and sleeps 6. It’s been listed on Holiday Lettings since 13 Oct 2009. Located in Vallandry, it has 5 reviews with an overall rating of 5. The average weekly rate is £1515. The Owner has a response rate of 63% and the property’s calendar was last updated on 05 Mar 2019. Just had a great week at Chalet Beaumont , the chalet was a perfect home from home in a fabulous location - we loved it! The chalet is located 5 minutes walk from the Vallandry lift with views over the valley. Very well equipped we were provided with everything we could need for our stay, including microwave, dishwasher and washing machine / iron etc. Hot water was plentiful and the beds very comfortable. Parking the car wasn't an issue, there is plenty of free parking just above the chalet and we were able to park outside the door whilst unloading. The staff at PVR (local keyholders) provided a really good service, delivering bread each morning, wood for the fire and making restaurant reservations for us which was really helpful. We ate out at La Fontana, great steaks on a sizzling hot stone. Paradiski is a great ski area with something for everyone, we had a local area pass which included a days skiing over in La Plagne, being in Vallandry its only one run down to the Vanoise Express gondola over to La Plagne so easy to spend a full day over there. We experienced weather extremes, lots of snow to start but we've returned home with a tan after some fabulous sunshine skiing. Will miss the view and beautiful sunrise whilst having our breakfast! Owner's reply: Thank you so much for taking the time to write about your stay. It is quite a magical place and the ski area is huge.